The EOS 7D features an all-new 18.0 Megapixel APS-C size CMOS sensor and Dual DIGIC 4 Image Processors, capturing tremendous images at up to ISO 12800 and speeds of up to 8 fps. The EOS 7D has a new all cross-type 19-point AF system with improved AI Servo II AF subject tracking and user-selectable AF area selection modes for sharp focus no matter the situation. The EOS 7D's Intelligent Viewfinder, an entirely newly-designed technology, provides approximately 100% coverage and displays user-selected AF modes as well as a spot metering circle and on demand grid lines. New iFCL Metering with 63-zone dual-layer metering system uses both focus and color information to provide accurate exposure even in difficult lighting. 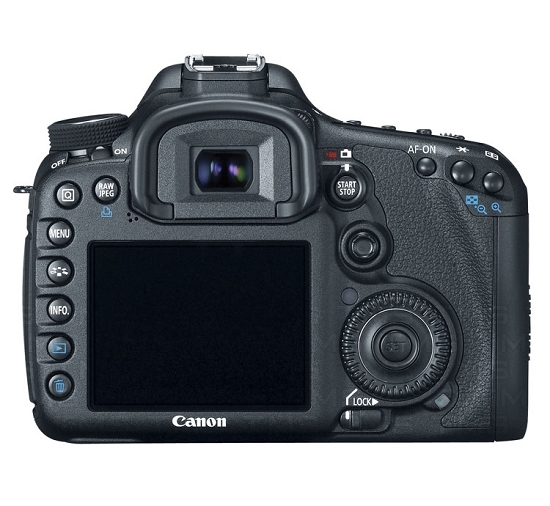 The EOS 7D also captures Full HD video at 30p (29.97 fps), 24p (23.976 fps) and 25p with an array of manual controls, including manual exposure during movie shooting and ISO speed selection. 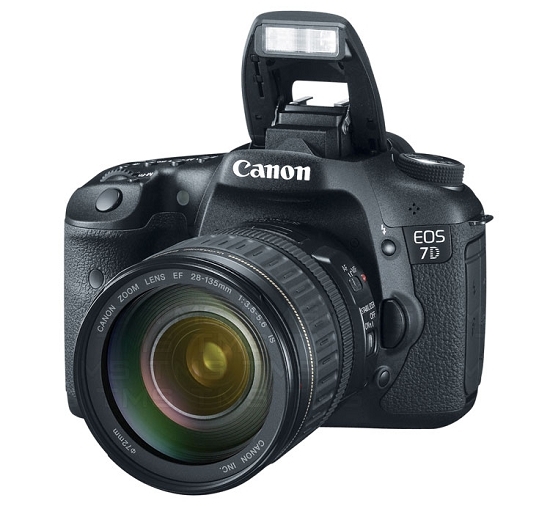 The EOS 7D features a magnesium alloy body that is dust- and weather-resistant and shutter durability of up to 150,000 cycles. Compatible with over 60 EF and EF-S lenses as well as with EOS System accessories, the creative opportunities - not just with stills but also with video - are beyond amazement. 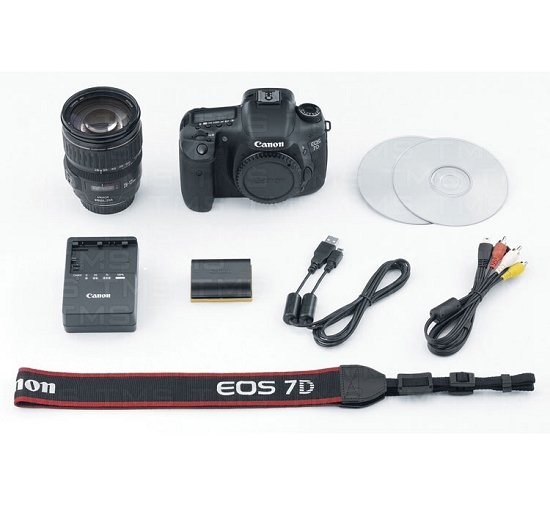 Includes: EOS 7D Body, EF 28—135mm f/3.5-5.6 IS USM Lens, Eyecup Eg, Wide Neck Strap EW-EOS7D, Stereo AV Cable AVC-DC400ST, USB Interface Cable IFC-200U, Battery Pack LP-E6, Battery Charger LC-E6, EOS Digital Solutions Disk, Software Instruction Manual. Maximum resolution for any application. 18.0 Megapixel CMOS Sensor and Dual DIGIC 4 Image Processors for high image quality and speed. 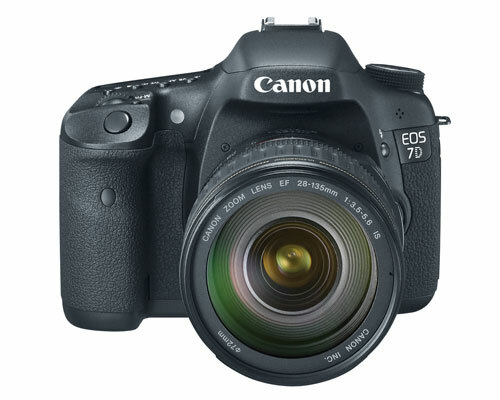 The EOS 7D features a Canon-designed 18.0 Megapixel APS-C size CMOS sensor that captures such a high level of resolution it's easy to crop images for enlargement without concern of losing detail. A major factor in reducing noise, the CMOS sensor assures that images shot at highest sensitivity will be remarkably smooth. Dual DIGIC 4 Image Processors ensure that images are captured, processed and saved with remarkable speed. The EOS 7D's ability to capture and process data of images shot at 18.0 Megapixels at 8 fps, as well as Face Detection Live Mode, Full HD video recording, Auto Lighting Optimizer and Lens Peripheral optimization are all possible thanks to the Dual DIGIC 4 Image Processors. Low Light Excellence. ISO 100-6400 (expandable to 12,800) for shooting from bright to dim light. With a broad range of ISO settings, the EOS 7D enables shooting from dawn through dusk and ensures capture of the finest detail. With enhanced, low-noise high-sensitivity optimization, shooting in situations previously possible only with flash becomes as simple as point and shoot. The Speed You Need: 8.0 fps continuous shooting up to 126 Large/JPEGs with UDMA CF card and 15 RAW. Capable of shooting up to 126 Large/JPEGs with a UDMA CF card and 15 RAW at 8 fps, the EOS 7D is a perfect camera for action. Canon's remarkable shutter, combined with speedy, sophisticated electronics, ensures instant response and performance. A rapidly-occurring scene can be captured moment by moment, second by second, so that even the briefest of opportunities are captured in perfect clarity.